This excellent volume is one part of the Tara Books’ Indian Album series of photographic collections. The series features works from photographers who reflect the breadth, diversity, and complexity of India. The release of The Flag coincides with the annual August 15 celebration of the anniversary of India’s independence. The flag itself, commonly known as the tricolour, is very nearly ubiquitous in India annually on that date. 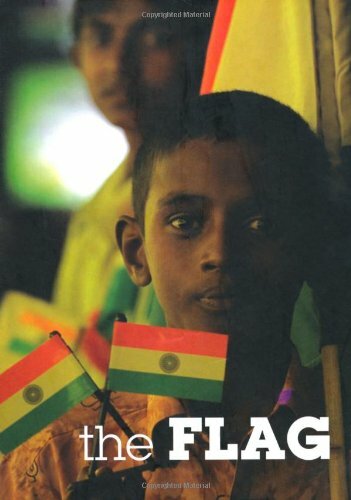 Author Lakshmanan, also an award-winning journalistic photographer, selected 90 pages of striking and compelling images of the flag in use, in decoration, and in creation. The images themselves are the work of 30 photographers, mostly unknown, from varied regions of India. The individual photographs Mr. Lakshmanan selected for The Flag convey a civic pride and dignity apposite to the independence commemoration. This is not to say Mr. Lakshmanan’s assemblage of images ends with a celebration of patriotic pride and a special day. Rather, The Flag is a photographic journey through the simultaneous complexities and simplicities of India. The images recount a fascinating story of everyday life as witnessed by the flag—life that symbolizes of the struggles and hope of the people of India. The collection tells varied stories: of the religious and economic diversity of the country, of the impact and intricacies of the country’s history on a range of individuals. And as in all stories, juxtaposed with somber images are joyous, proud, exciting ones. Among the outstanding images in this collection, different readers will find their own favorites, those that stimulate their curiosities or plumb their emotions. Perhaps one will be the opening photograph, the perceptive capture of the tricolour reflected in and energizing a tired eye. Or it could be the artist who painstakingly recreates the flag on each of a multitude of tiny clay pots. Some might be curious by the range of facial expressions of a multigenerational group of people walking, children leading and supporting an elderly woman. A striking image of two very young children, dusty, clothed only in underpants, on a pile of gravel, prompts the observer to ponder their experiences, their thoughts as they hold their flags—one raised, one lodged in the stones. The Flag is an exceptional photographic collection. It is also is a narrative, a visual essay comprising carefully selected and astutely positioned images in which the tricolour is a character and a symbol, and even a driver of plot. The Flag is a powerful example for the other volumes in the Indian Album series. Kim Nayyer B.Sc. LL.B. MLIS, is a librarian and genre editor for Island Writer literary magazine.